Your blog has a lovely rhythm. It's hard to put into words what I mean but it is peaceful. I think the life you strive to achieve for yourself comes out in your writing about your lifestyle. 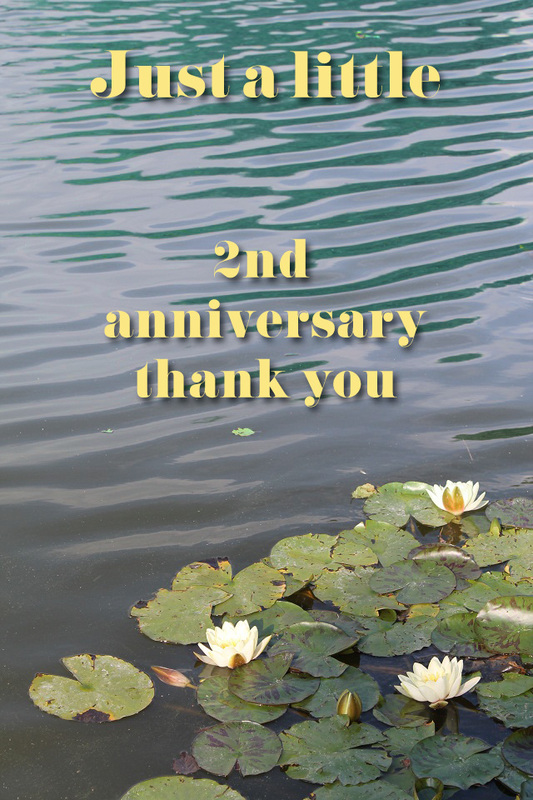 Happy Second Birthday and thanks for a lovely blog. I have just started my blogging journey so my six month birthday is the milestone that I'm hoping that I'll reach. Thanks for all your hard work. Congratulations on your second anniversary. It's great to share the good things in life with a like minded community isn't it? It will be my third anniversary soon, so I'm planning a bit of a give away. Congratulations Claire on your 2nd anniversary - and I'd like to thank you again for your wonderful blog! Congrats on your 2nd blogging anniversary. I admire anyone who can do this regularly and still come up with fresh things to talk about. I think it is far less stress when you only have what you actually need. This tablet and broadband are my main " want ",if you like. It is the world at your fingertips. I don't have a car or t.v. or auto washing machine.When you have had serious illness (my husband) and can no longer work everything falls into place. The most important thing is time spent together. This is a rented terraced house that we live in but now we have no worries about where the money will come from for any repairs. Its being able to adjust, thats all. Happy blog anniversary! I only discovered your blog recently, but have been enjoying it. Happy blog anniversary! I enjoy your blog very much. I always learn something here. Wow .... two years already, where HAS the time gone!! Happy birthday. I enjoy your blog very much. It's very inspiring for someone who has more than she needs. Congrats and here's to a happy and peaceful Year 3! Congratulations Claire! It is a wonderful thing to keep the momentum going. I totally understand that as you enter minimalism/simplicity mindset/habits more, it becomes a more delicate balance between writing about it and living it. I have found that I write about it less now as I just live it. It is literally allowing us to live our dream as we travel for 7 months! !